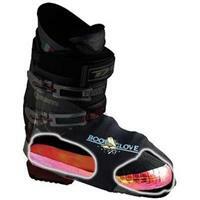 Combining the BootGlove™ alpine and ThermoFeet™ heat reflectors into an intergrated thermal retention system. The WickedWarm™ thermal layering system is easy to install on any alpine boot adding up to +53° F gain to the shell of the boot. Cons: strap underneath will wear out as you walk with them on. Boot Glove with thermal insulation is a definite plus. No moving parts or batteries to loose. Not as warm as heated boots but did make a difference in this clod 2014/15 winter. If between sizes order larger ,they run small.